From an early age, every VBFS student learns the importance of local and global conservation. Our students learn the tools needed to address significant challenges facing our environment. And at Friends, environmental education extends well beyond any single discipline as well as into every classroom. Our Early School students harvest ladybugs as a natural pest resistant for our community gardens. Our Lower School students grow and plant marsh grasses to combat shoreline erosion along our local waterways. Our Middle School students create and install campus rain barrels and work in our campus greenhouse. And our Upper School students research significant environmental issues through original empirical research studies. With our Oyster and Marsh Shoreline Restoration Work, students receive an educational experience that extends far beyond our 11-acre green campus and out into the Lynnhaven River and the Chesapeake Bay, the largest estuary in the world. Our students are constantly on the water. 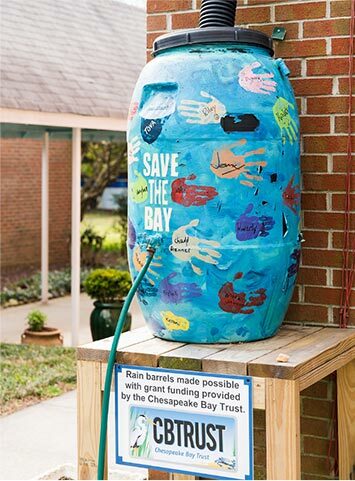 They work with the Lynnhaven River NOW and the Virginia Institute of Marine Science on projects throughout the year, learning about the importance of the Chesapeake Bay as well as how to actively protect our local water systems. Friends students also grow over 8,000 oyster spat yearly which they then place back into the water in various locations. They collect and cure oyster shell on campus, bagging it and buffering marsh shoreline with it, making new oyster habitats while also combating marsh erosion. Plus, our students take annual field trips to Smith Island and Fox Island, where they live off the grid and truly begin to appreciate the wonder that is the Chesapeake Bay.